Bistensee is a little lake in northern Germany, near Eckernförde, just a few kilometers long and not even one kilometer wide. 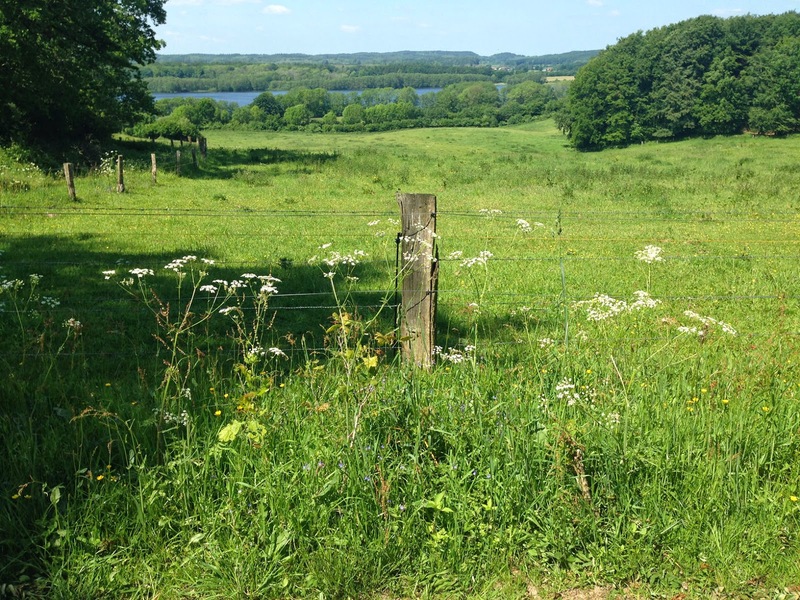 Most of it is a nature preserve, so there is little development along its shores: it's mostly woods and farm fields, with little Bistensee village at the east end, a campground and a few vacation houses at the west end. There's not much to it, but it's a great place to just relax and enjoy being out in nature: swimming, sailing, windsurfing, biking, hiking, grilling and -- of course -- running. There's a 9-km trail around the lake, the Bistensee Rundgang, and other little trails and back-roads all over. 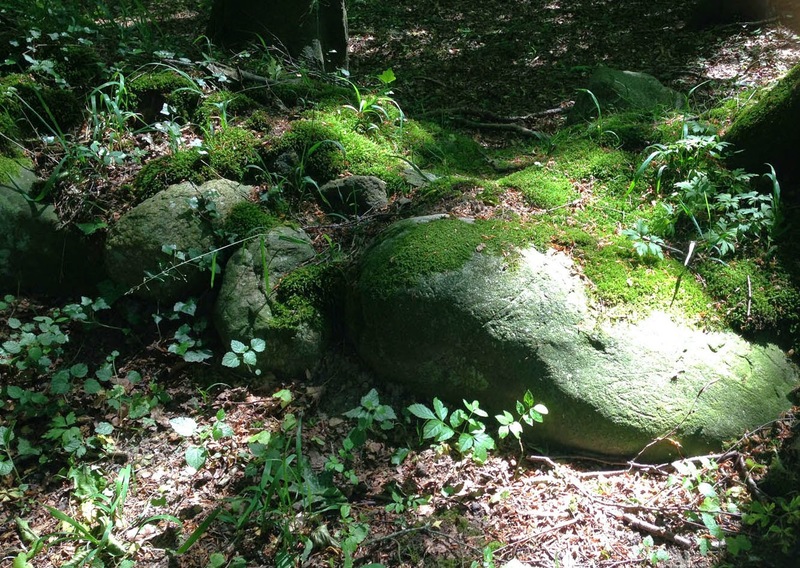 There are wooded little hills around here -- the Hüttener Berge -- that add enough challenge to any run. This fun run will follow part of the lake trail as an out-and-back. But if you want to do the whole thing, it's described here, as I've been down there quite a few times. The trail on the other side of the lake is badly marked in a few spots, though, so be prepared to hunt around for the right trail if you decide to do the lake loop. We'll start the run at the southeast corner of the lake, where the road into the campground -- Uferweg -- begins. This is right at the southern city-limits sign for Bistensee village. Start of the run: take the trail to the left! Right after the turnoff onto Uferweg, you'll see a map of the lake and the trail. The road forks here: take the left-hand trail, bypassing the campground itself. You'll head past some fields and into a woods. Just follow the main trail through the woods, looking for the white trail signs with the blue picture of the lake. The trail curves to the left through the woods, and comes out into another trail where you turn right and follow it along the south edge of the woods, heading west. In just a couple of hundred meters, the trail ends at a little paved road. Turn left here and head south, with horse pastures to the left and a field and woods to your right. It will go down and back up a little valley next to the pasture. 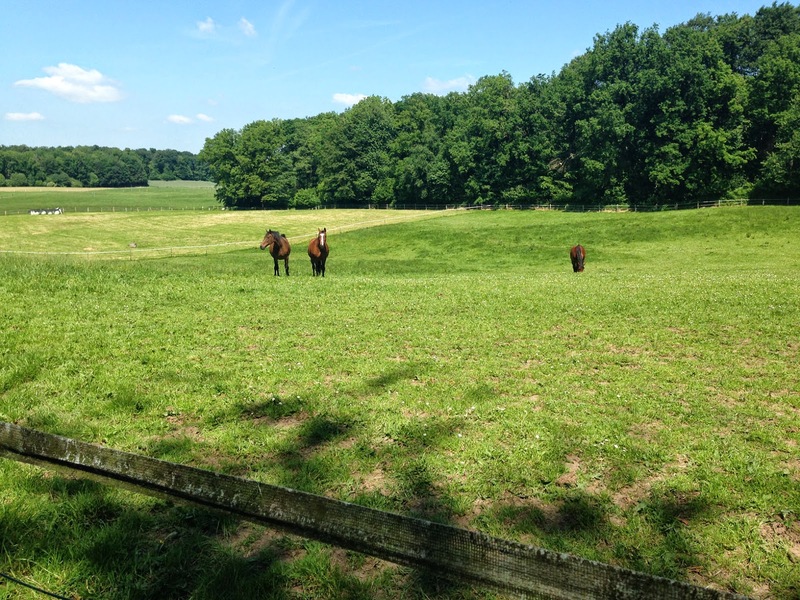 At the end of the pasture, there is a "Y" in the road, where you turn right, going past an idyllic farm with horse stables on the left side. Just past the farm, turn left to head uphill along the trail, still following the lake-trail signs. 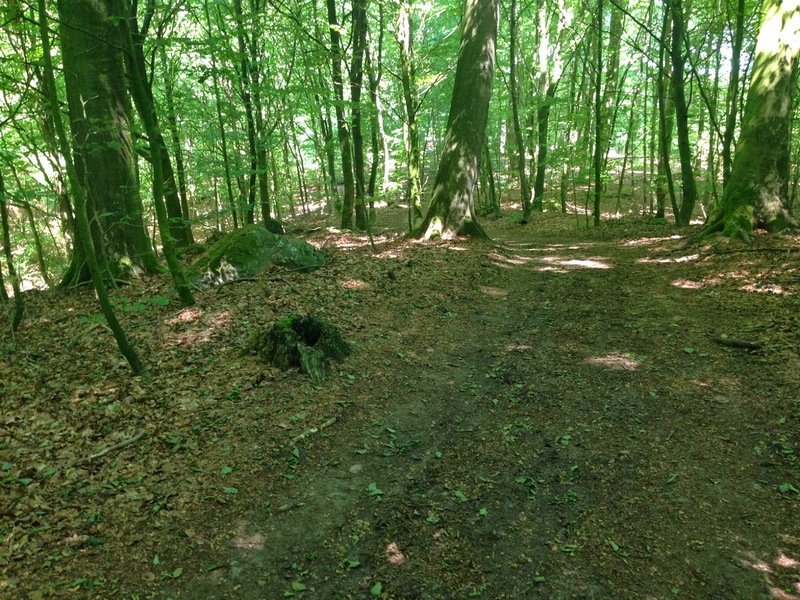 This is a beautiful beech-tree woods. This is the hard part of the run, gaining 30 meters to the top. At the top of the ridge, you'll come to a dirt road, where you turn right and follow the road, with fields to the left and the wooded slope to the right. The road makes a zig-zag: first right, then left, and comes out above another pasture, spreading out along the hillside to the right, with a great view out over the lake and to the hills on the other side. At the far side (west side) of the pasture, the trail turns right to go into more woods. Just follow the dirt trail through the woods for 200 meters until you come to a trail-crossing. This is the turn-around spot for the short 5.9-km out-and-back: just head back along the same trail that you just came here with, with almost no traffic. If you want to continue with the 9-km lake loop, turn right at the trail-crossing and head down the steep, sandy trail to the little paved lake road (the one that we were on at the farmhouse). Follow the Bistensee trail markers! Now turn left and run past the beautiful thatched-roof café and pottery workshop, Töpferhaus, with a really nice lakeside hotel right behind it. 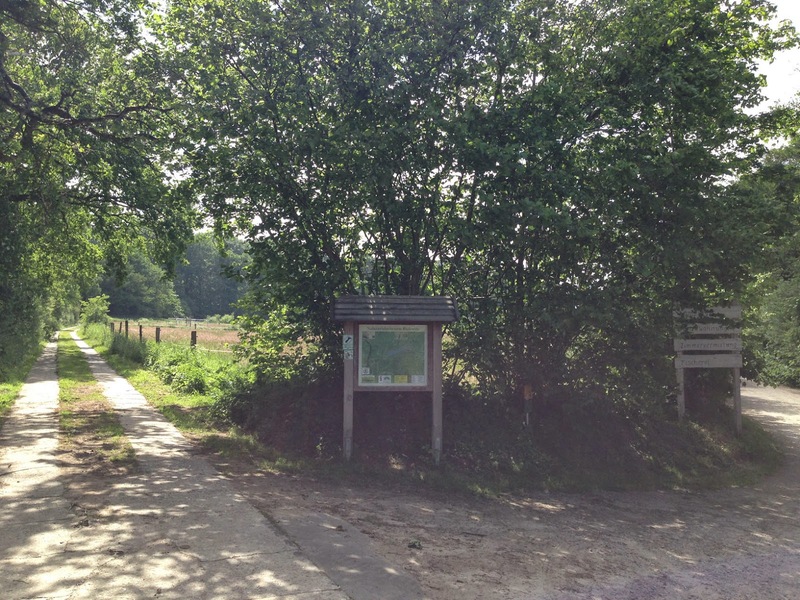 Keep running westwards on the little road until it ends at a bigger road, connecting Alt-Duvenstedt with Ahlefeld. Turn right to run along the paved bike path and then turn right to run back towards the lake (this detours a farm that didn't let the lake trail through their property). At the lake, you're now at a group of little lakeside holiday houses. Turn left here and follow this road past the narrow, west end of the lake. 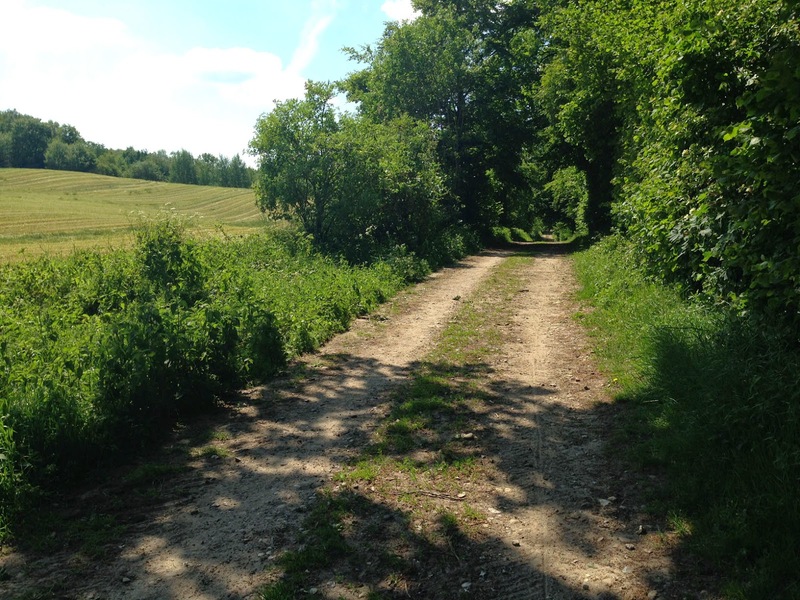 It will soon run back into the main road, but you can avoid running directly on the road by following the trail as it goes up on the right, bordering the next field. You'll come to a woods, where you turn right to leave the main road and follow the dirt road bordering the woods. That trail ends, and turns left, into the woods. In a short time you need to turn right, then turn right again onto the first really little path, that follows the edge of the woods (this is where the trail signs are a bit lacking). You'll leave the woods by going through a gate to cross a cow-pasture, then exiting through another gate. 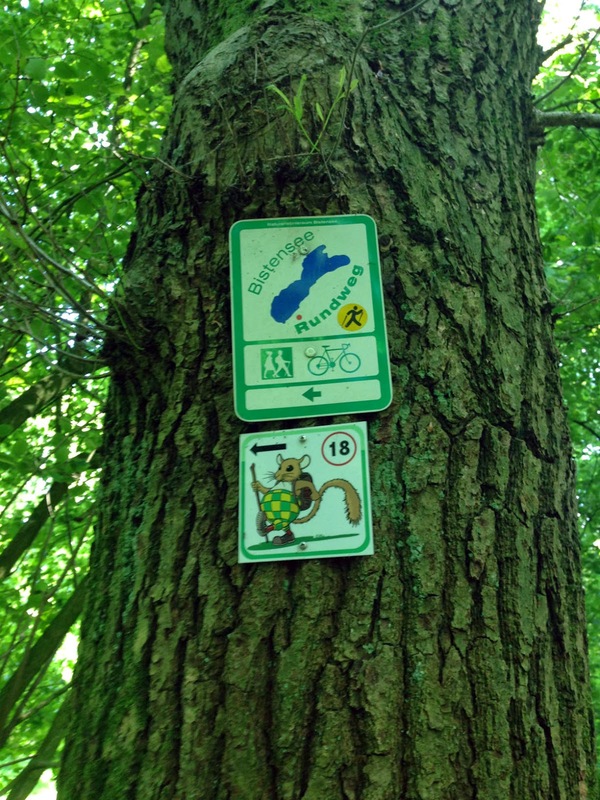 Now follow more of the trail signs to get you through the next stretch of woods. At the end of the woods, the trail turns to the right (very narrow at this point) to go through more fields before coming directly to the lakeside. Now, it's easy to follow the trail, as it continues right along the water for the next 1.3 kilometers. This is another really beautiful part of the trail, with nothing but trees and fields lining the lake. The trail finally leaves the lake and comes right out into a little new neighborhood of wooden single-family houses in Bistensee village. Run past the houses to the main street, where you turn right and head through the village, back to the starting point.